Introduction -- They begin by saying it's "NOT AN AUTOMATED RESPONSE" -- Really? Read on. 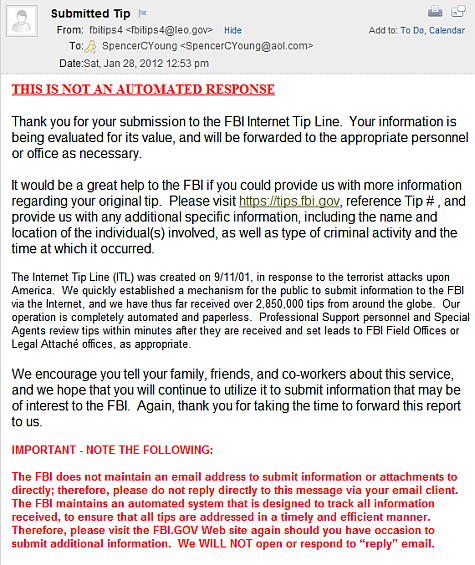 Do Not Reply -- They report the FBI does not maintain an email address to submit information or attachments. Why Not? They go on to say: "We WILL NOT open or respond to "reply" email. Why Not? Now Put It All Together -- The FBI requested information that was already provided, and asked that it be sent via an on-line form that was already submitted, however, there is no way to send an attachment of additional information because they won't accept it nor read it, and after being asked to provide information they already have, they said be sure to include the "Tip Reference #" that they never provided. You just can't make this stuff up. Is this process a mere ruse to only give the impression that the FBI will serve to protect and seek justice on behalf of U.S. citizens who have been victimized? We shall see . . .